I picked up my great nephew Jordan this afternoon. His grandparents work at the local school and they had a fall festival this evening. It would have been an extremely long day had I not brought him home with me. Before we left he had to show me his watermelon that volunteered to come up in the gutter by the drive at the school. Once he realized what it was, he has cared for it since late summer. When I got him in his car seat I asked what he wanted for supper. PIZZA, he said with enthusiasm and conviction. Pizza it is. We headed to Walmart and I tossed him in a buggy. We grabbed a couple pizzas and I picked up some coffee. We needed a box of cereal so I headed toward that aisle. We don't buy sugar cereal, but he locked in on Fruit Loops. I tried to disuade him but he kept saying they're good. I told him if they had high fructose corn syrup that we couldn't get them because Jilda would yell at me (not really but we don't buy that stuff). When I checked the box, it had real sugar, so I got him a box. On the way out, we passed through shelves of beer and I said much too loud, NO YOU CAN'T HAVE ANY BEER! I don't like beer he protested. I could hear grownups chuckling all up and down the aisle. Once home, I popped the pizza in the oven, cranked up his kid shows on public television and we had a grand old time, but I'm whupped this evening. Little kids have a way of doing that to us - just plum tuckered! Awww love how Jordan's caring for this lonely watermelon in the gutter! Good luck to that watermelon! Yumm..pizza and fruit loops..sounds like a great time..enjoy the weekend! Nothing like spending a day with a youngster, and going to Wal Mart. No wonder you are exhausted! 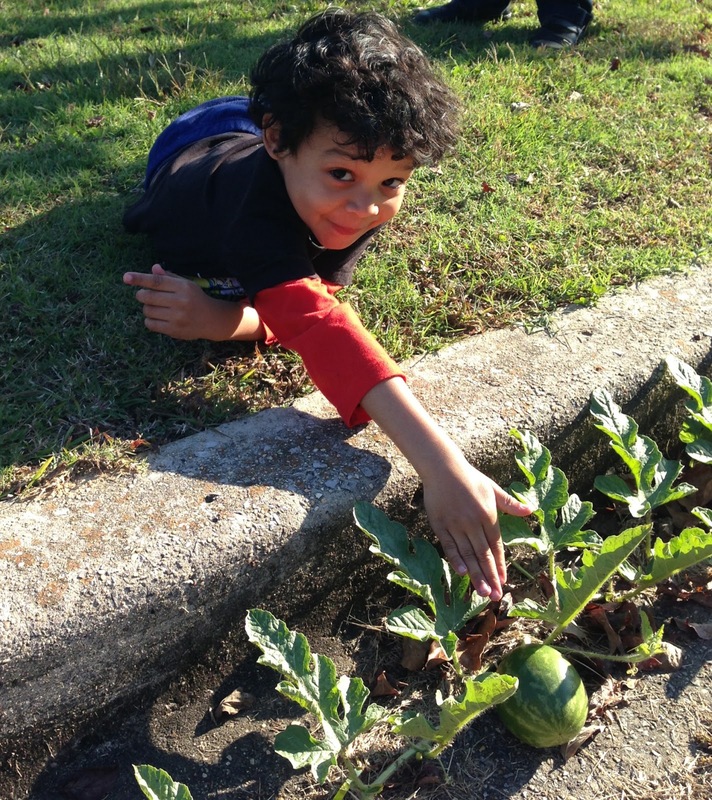 Hope Jordan's watermelon has enough time to ripen before winter.